If you had $39 million, do you think you could complete a movie on schedule and under-budget? And if you didn’t, would you be worried? Not so, if you're Quentin Tarantino, the man who has brought us cult classics like Reservoir Dogs (1992) and Pulp Fiction (winner of the top prize at the 1994 Cannes Film Festival). According to "Entertainment Weekly," the QT homage flick to the martial arts films of yore, Kill Bill, is slightly behind schedule and "ever-so" slightly over budget. With a targeted wrap scheduled for October 2002, principal photography halted on Christmas Day after Miramax gave the director a drop-dead completion date. And while shooting costs are not necessarily written in stone until the dust settles, the film's budget appears to have ballooned to the $50 million level. That doesn't seem to have bothered QT though who states, "...budget overruns are just bureaucratic curlicue." Kill Bill, written by QT over a period of two years, was sparked by a conversation he and Thurman had while shooting Pulp Fiction in 1993. The film itself may strike the masses as another gore-fest by the ex-video clerk turned director but, to the more astute fan, the director's latest outing will be a triumphant return to the glory days of Kung Fu and Samurai flicks. The plot: Uma Thurman stars as a recently retired master assassin who is gunned down on her wedding day by former boss and lover - Bill (David Carradine of 1970s TV series Kung Fu fame). Four years later, she awakens from her coma and resolves to wreak vengeance by hunting down the killers in Bill's organization. Amongst this group is a bevy of beauties called the Deadly Viper Assassination Squad (Vivica Fox, Daryl Hannah and Lucy Liu). 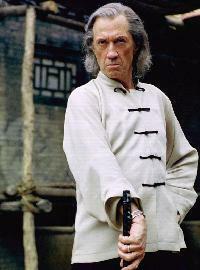 Others include Julie Dreyfus aka "Sofie Fatale" and Shaw alumni Gordon Liu aka "Pai Mei." 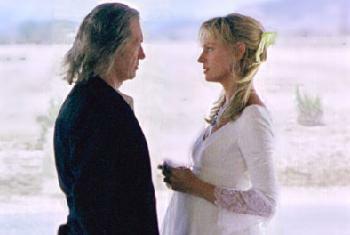 Thurman (aka "the Bride") ultimately tracks down the treacherous Bill and they engage in a fateful confrontation. According to film sources, Bill was killed on the 135th day of shooting but that doesn't mean the movie is complete. Far from it. While principal photography wrapped in Beijing and Tokyo, additional footage and minor scenes were needed to be shot in Mexico during January. Action star Gordon Liu, who’s participation in the film was completed last summer, recently announced to Hong Kong papers that he has been asked to return to the US for further shooting. What's unique about this film is the way QT is going about it. In today's cinema, we have been inundated by CG special effects and the "wire-fu" techniques many have become aware of due to films like Crouching Tiger, Hidden Dragon. 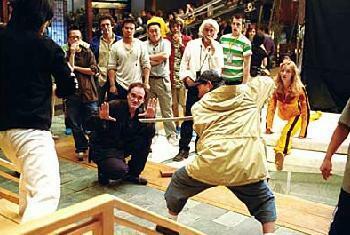 Instead, QT has made it clear that Kill Bill was to be made... "the Chinese Way." He comments, "...Chinese way of doing action is there's not really a schedule ... no shot list. I have certain shots in my mind that I know I want to do but now, me and the master (Yuen), come up with new things as we're doing it." Shooting almost exclusively in China, QT has immersed cast and crew into making this film evoke the style of the old school Asian "chop-socky" films; even replicating the comical violence such films were [in]famous for. While new technology offers many advantages to today's filmmaker, QT has opted for the same low-budget effects his idols (such as legendary Shaw director Chang Cheh) used when making their films three decades ago. In order to capture the style of these now cult classics, QT had his Academy Award winning cinematographer (Bob Richardson) watch such Shaw Bros. staples like Five Fingers of Death and One Armed Swordsman, prior to the production, to fully grasp the look he's envisioned. QT has also enlisted two of Asia's most talented. Yuen Wo-ping (known best to western audiences for his work on Crouching Tiger and The Matrix) was hired as fight choreographer while Japanese screen idol Sonny Chiba is on board as combat coach (and cast member as well). 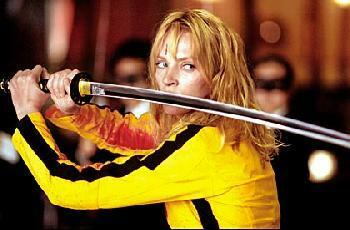 With 700,000 feet of film already in the can, will Kill Bill be coming to your local theater soon? Unfortunately, we'll have to wait until mid-October for the release. But, to many fans, that seems a wait worthwhile for a film - 30 years in the making. Sources: Entertainment Weekly and Time Asia Magazine.